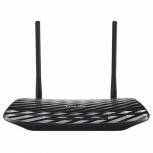 TP-Link AC750 Wireless Dual Band Gigabit Cable Router ARCHER C2 Pack of 1 TP-Link AC750 Wireless Dual Band Gigabit Cable Router ARCHER C2. Supports 2.4GHz and 5GHz bands simultaneously. USB port for sharing storage or a printer. 4 Gigabit ethernet ports. Supports cable broadband internet over WAN. 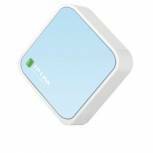 TP-Link 300Mbps Wireless-N Nano Router TL-WR802N Pack of 1 TP-Link 300Mbps Wireless-N Nano Router TL-WR802N. Supports Wireless N standard for speeds up to 300Mbps. USB powered from mains or PC. 1 x Ethernet port for internet access. WPA2 encryption.